PIMCO Managing Director William Gross offers his opinion that college degrees might be overvalued and it is a valid point. Now that might be odd since I’m an educator, but let me explain. The global marketplace has radically changed over the last decade and it is placing more value on math and science, rather than the liberal arts. Therefore, the value of a college degree varies based on area of discipline and academic rigor. In today’s educational environment, there is more focus on ensuring that all segments of society matriculate through the K-12 system. The primary objective is to lower dropout rates, which is an admirable and worthwhile goal because it has the potential of decreasing crime and boosting productivity. However, achieving that goal by lowering expectations and not insisting students meet key academic requirements has severe consequences for the rest of the student body. Human behavior revolves around tying action to consequences. There is a perception that many school districts are giving a free pass to unruly or disengaged students. By not intervening at an early stage, there is no incentive to change these self-defeating acts. Not only is this damaging to the low-performing student, it affects the morale and productivity of the rest of the classroom. If this perception is true and students are leaving high school and entering college without a good foundation, then they are not equipped to fully take advantage of the benefits of a college degree. In a global economy that is placing greater emphasis on math and science, students are avoiding those rigorous disciplines in favor of liberal arts where evaluation is more intrinsic and subjective. It is certainly not my intention to denigrate liberal arts because there is great value in possessing strong communication and critical thinking skills. However, it is easier to meet minimum requirement in the liberal arts than nursing, engineering, math, and economics, since the later disciplines require quantitative competencies that are more objective and not subjective. In fact, a superior liberal arts students will remain in great demand because they will have a strong foundation in critical thinking that will prepare them for a variety of disciplines. What is needed is higher standards for not only students and teachers, but also parents. While there are some who believe that will result in more students falling through the cracks, it is my belief that our youth will rise to the challenge of higher expectations. As an advocate for broad-based economic growth and minimizing income inequality, we must change our paradigm to properly equip all segments of society to deal with the needs of the global economy. The United States prides itself as being the “land of opportunity”. With the U.S. being a favored destination for immigrants across the world, that distinction still has merit. However, there are disturbing trends where many are questioning the value of capitalism due to its contribution to income inequality. Even so, we must acknowledge the role that capitalism played in lifting not only Americans out of poverty and into prosperity, but in Canada, Europe, and all parts of the world. Having said that, we must recognize that our current economic system needs to be amended to level the playing field. Many Americans are divided on the moral implications of income redistribution. On one hand, there are those that believe that extravagant wealth is immoral and that there should be a limit on executive pay. In fact, Japan has embraced this culture and have stifled executive pay. Their executives must publicly disclose their pay if it exceeds $1.1 million and only 7.5% of them exceeded this baseline. That is dwarfed by American executives, whose top 10 earn between $43 to $131 million in annual salaries. Then there are others, who believe too much income redistribution is immoral because it unfairly penalizes hard work and achievement. When an individual makes sacrifices in their education and career, why should they be forced to give up a portion of their earned pay to subsidize an irresponsible individual, who squandered opportunities by not valuing their education early in life? If taxes are increased substantially as your income rises, then the payoff of extra work and risk is lowered. Why go through the rigors of medical school, engineering, and law school, when one can make a similar amount in a less demanding field? 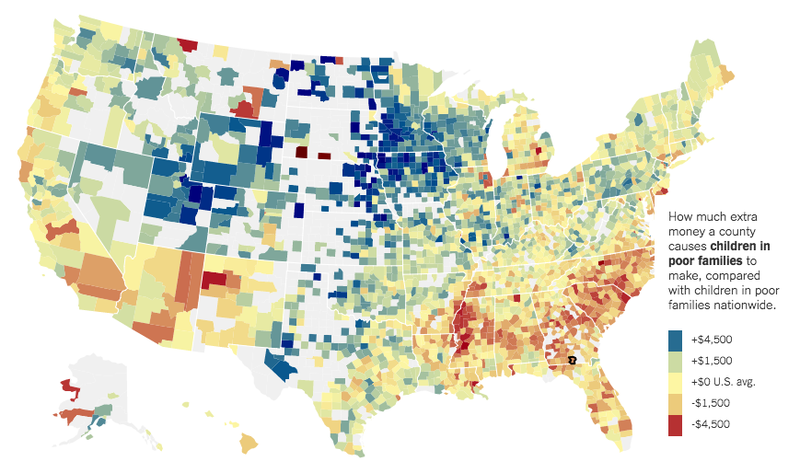 In deciding between two competing narratives, the difference comes down to economic mobility. 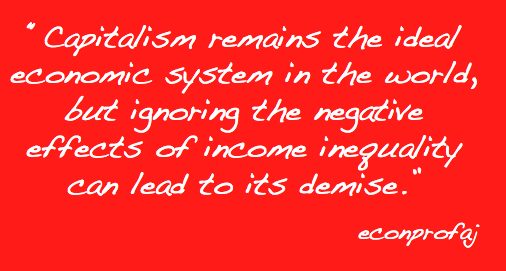 Is our present economic system more conducive to promoting competition between social classes? Unless one believes that effort and ability is only consigned to the affluent, one would think that the U.S. economy and its promotion of economic liberty would result in healthy movement between the poor, middle class, and upper class. However when compared to our peers, we are laggards. Markus Jantti’s study comparing the U.S. with the United Kingdom, Denmark, Norway, Sweden shows that Americans are less likely to rise from poverty across generations than any of those four countries. Certainly, it is fair that a successful professional, who has excelled at their craft, should be able to pass their hard-earned dollars to their children to help them compete. One of the motivations to taking on additional responsibilities on a project or working 60-70 hours a week is to provide a better life for our children. That means living in a better neighborhood and access to superior schools. However, should there be limits imposed on those advantages in the form of higher taxes? Specifically, there’s a growing body of research that income inequality imposes significant costs on the economy. In order to counter these costs, there are policy initiatives that would boost equality and shift the economic gains would shift from the affluent to the low and middle class. 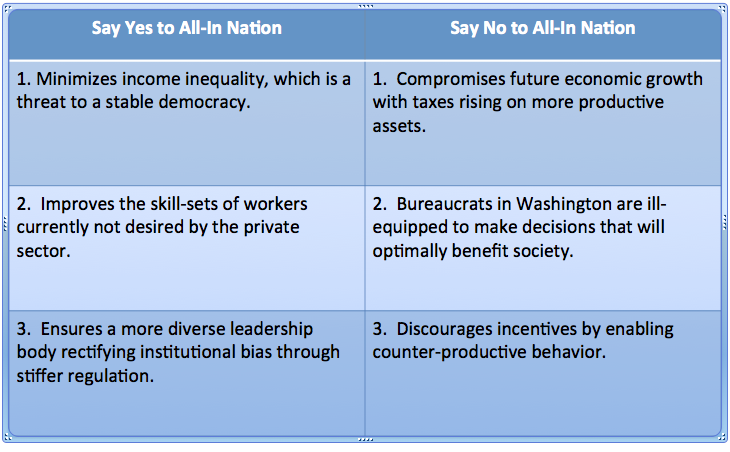 When there is too much income inequality, it can actually inhibit economic growth and cause more instability. Raghuram Rajan elaborates on this view in Project Syndicate. Specifically, he blames deregulaton and legislative acts promoting home ownership as the root causes of the financial crisis as low- and middle-income households took on too much debt to maintain their standard of living in the face of declining income growth. 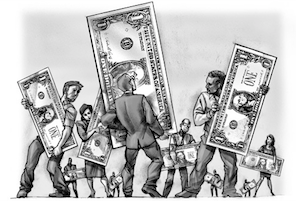 With rising inequality, the occurrence of rent-seeking is more prevalent. This is where individuals use their financial resources and influence to affect policies that benefit their interests over society. The prevalence of special interest groups and less restrictive campaign financing laws provide the potential to seek loopholes and other avenues to enrich themselves at the expense of others. Columbia University economist Stiglitz pointed to lack of effective oversight of the financial industry where irresponsible mortgage products caused our steep recession. Then there are exploitations of the tax code where societal benefits are minimal when these advantages boost corporate balance sheets, rather than worker payrolls. Lastly, it stunts the progress of competitors who are not able to buy influence. It is imperative that we achieve legislative reform that minimizes the influence of special interests and replace it with investments toward minimizing the skills divide. A two-pronged attack is necessary. First, we need a quick fix in updating adult skill sets that are struggling to meet the requirements of a technology-based economy. As for schools, they must find ways to increase academic performance within low-income and middle-income households despite challenges within family structures and less than ideal neighborhoods. This must start with better parental training and access to early child education resources. Both will require more funding and resources. Capitalism remains the ideal economic system in the world, but ignoring the negative effects of income inequality can lead to its demise.